Munday Mazda invites you to visit our new and used dealership in Houston, TX. Our team members are standing by to provide you with some of the best deals near you on Mazda cars and SUVs, as well as financing, maintenance, repair, parts and more. Find out why we are one of the Houston area&apos;s most trusted Mazda dealers. Munday Mazda le invita a visitar nuestro concesionario de autos nuevos y usados en Houston, TX. Visi´tanos hoy para carros Mazda y SUVs, asi´ como servicio completo, autofinanciamiento y ma´s. Nuestro equipo esta´ listo para ayudarle a descubrir porque´ somos uno de los mejores distribuidores de coches Mazda en el a´rea Houston. Everyone that we worked with here at Munday Mazda was great, and very friendly. No hassles and straight forward. Jerrell was exceptionally friendly and a good salesman . Coby was very patient and thorough with me throughout my car buying process. Highly recommended!!!!!! I am thankful that I went to Munday Mazda for my vehicle purchase. The salesman, James Glasper worked tirelessly to make sure we had a deal that worked for both our tastes and our budget. Thanks Munday Mazda!! Excellent customer service!!! 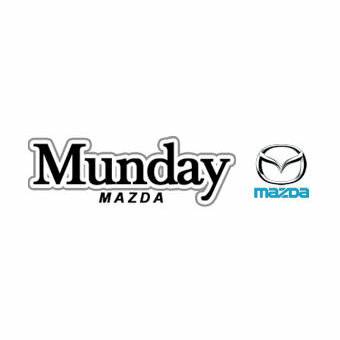 I am very happy with my experience at Munday Mazda and Wolf was GREAT!!! In the beginning I was nervous from last experience at Jeff Haas but, Kendrix, Xavier, and Hebert Brown made my experience easier!!! Mr. Glasper was awesome!!!! He was the best salesperson I have ever dealt with!! I would recommend him to anyone. James Glasper is an excellent salesman!!! One of the best salesperson I've worked with. See him for my next vehicle soon. As first time customers our experience was great. The sale persons Xavier Brown & Kendrix Williams were very professional. Excellent salesman. I will recommend both of these young men to my friends and family. Excellent, as usual and as expected. Staff was good, very respectful, helpful and friendly. Thank you! I have even recommended my friends that don't own Mazda's to service there as well. Amazing Staff! I purchased my car there six months ago, and was given the best treatment! Great Service: I worked with a service agent by the name of Joe. Told him I was inbetween jobs, and if he could hold the costs down. He kept his promise, making it affordable, while fixing the car beyond what was even needed. Very good experience, we never felt any pressure from the sales team (Libby & Mike) Any questions we had they were quick to answer or find out the answer.